A recent Los Angeles Times article, “Curry leaf tree, a touch of India in the backyard,” reminds me that my dad’s old office had a curry leaf tree growing just outside his window. From time to time, while he was working, he would see desis drive or walk up to his office building and step up to the elevated garden area to grab a bunch of the fragrant leaves to go. My grandma lived next to his office and she planted the tree many years ago. Of course she wasn’t the only one to do so in sunny southern California. Rishi Kumar’s grandmother brought curry leaf seeds from India, and his mother planted them 18 years ago at her home in Diamond Bar. Now the curry leaf has filled out into a mini-grove of slender stalks, bushy with the pointed leaves essential to Indian cuisine. 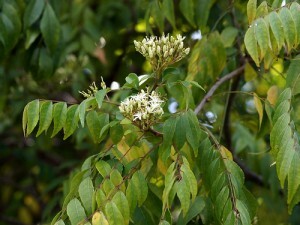 For more information on the curry leaf tree read the rest of the article. It’s part of a Tuesday series called the Global Garden. What did you serve this Thanksgiving? Did you desi-fy your turkey? (Aarti Sequeira has a recipe for tandoori turkey here.) I grew up in a vegetarian household, so no turkey for me, but we did have pumpkin raita and cranberry chutney on the table as a nod to the holiday. Posted on October 30, 2011 by V.V. Anyway. Hindi on the side of a bus in America, for the quintessential American fast food chain, which is now selling various South Asianish foodstuffs, by which I mean mangoes and coconuts are involved. If you have tasted any of these foodstuffs, please revert. When I was younger, yogurt repulsed me. This was no small thing because my parents come from southern India, where yogurt seems to serve as a sort of digestif without which meals don’t feel complete. 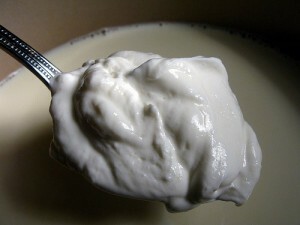 There was always a pot of homemade yogurt in the fridge or on the kitchen table. The professor put them in touch and they got to growing their business idea. 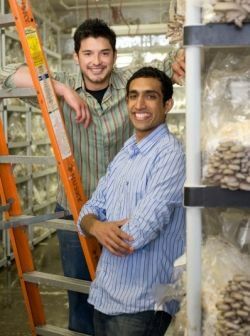 They asked Peet’s Coffee for used coffee grounds and set up ten test buckets in Velez’s fraternity kitchen to try out mushroom farming. Only one bucket grew a crop of mushrooms. They took the single success to a famous Berkeley restaurant, Chez Panisse, to get those mushrooms checked out–they were sautÃ©ed and deemed good. (If you’re wondering, mushrooms grown in coffee grounds do not pick up a coffee kick to their flavor.) The two budding entrepreneurs took the same bucket to Whole Foods and caught the interest of store employees. Their idea also caught the interest of their university, which awarded them a $5K social innovation grant. Is Suzy Singh the Next MasterChef? Have you seen the Gordon Ramsay-produced cooking show that takes 100 amateur and home chefs and attempts to turn one into a…MasterChef? I watched a few episodes recently and thanks to comments here and stories from the news tab, realized that Chef Suzy must be [Suzy Singh](http://www.suzysingh.com/), a neural engineer from Chicago. 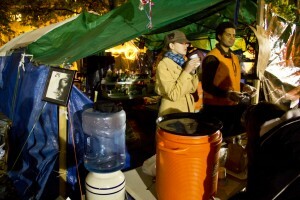 Singh, who participated in a brief Q&A posted below, made it into the 100 with a [signature dish](http://www.fox.com/masterchef/recipes/signature-dish/recipe-16) of Tandoori Cod en Papillote with Chai- and Saffron-infused Couscous, and she’s still a contender for the title of MasterChef on the show’s second US season now that the pool of 100 chefs has been whittled down to fewer than 10. 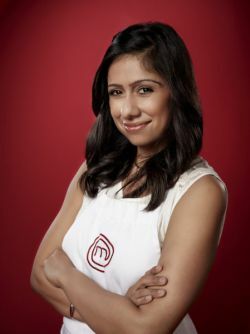 Singh is interesting to watch on MasterChef because she has skills, brings a real enthusiasm for cooking, and wears her heart on her sleeve, leaving no doubt as to how she’s feeling about her chances, her competition or the judges’ comments at any moment. Her style is also on display in videos which introduce viewers to the world’s largest holy kitchen at the Golden Temple and Kesar Da Dhaba in Amristar, Punjab. Floyd Cardoz is America’s Top Chef Master. He won the show’s final challenge despite LA traffic leaving him with the least cooking time of the finalists, and he did it his way. His menu featured upma in addition to rice-crusted snapper in broth and an Indonesian dish called rendang a Malaysian beef stew called randang. 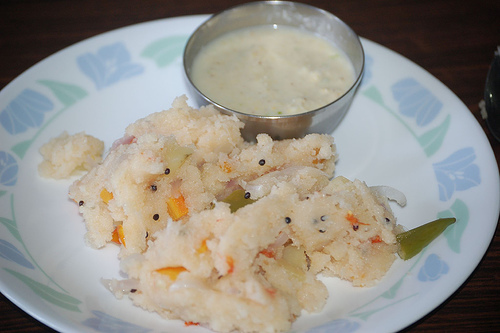 It was exciting to see a familiar-to-me-from-home-not-restaurants desi food like upma on the screen in the finale on the kind of show that often has me looking up its mentions of French foodie terms. Clearly what resonated the most with my California Desi population map wasn’t the population. It was the fact that I said, “I’d love to do a Cali road trip based on this map, and hit up the Indian restaurants along the way.” Y’all a bunch of foodies, aren’t you? So let’s do this again, crowdsource style. This time the google map lists those to-die-for hole-in-the-wall dhabas in the middle of nowhere. I’ve already taken the liberty to map the ones listed in the previous comment thread. 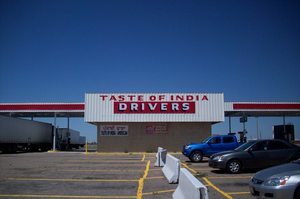 Do you have a Desi food place that is a must hit up place on a “kao, kao, kao” summer road trip? Do you have an interesting picture at one of these places? Please list it in the comments and I’ll drop it into the map as soon as possible. and it doesn’t have to be Cali centered. I only ask that you make recs for food that is good, places obscure and with a great story. 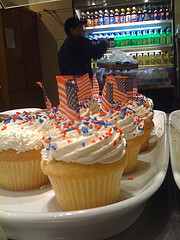 Eating American: The Fat Cost of Fitting In? Psychologists show that it’s not simply the abundance of high-calorie American junk food that causes weight gain. Instead, members of U.S. immigrant groups choose typical American dishes as a way to show that they belong and to prove their American-ness. “People who feel like they need to prove they belong in a culture will change their habits in an attempt to fit in,” said Sapna Cheryan, corresponding author and an assistant professor of psychology at the University of Washington. “If immigrants and their children choose unhealthy American foods over healthier traditional foods across their lives, this process of fitting in could lead to poorer health,” she said. The results are published in the June issue of Psychological Science.